lufc74 had the most liked content! 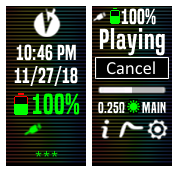 Forgot one thing - in Theme Editor the resistance will display on the screen to however many decimals I set it in source/options, but will always display only to the 1/10th on my Paranormal. Thanks Stepladder. Wouldn't normally be a biggie for me either, but recently bought 10 coils for my Nunchuka tank and one is rogue - 0.25 Ohms but reading at everything from 0.28 to 0.42 - and I need to know that the rest of the batch is OK.
Posted this in the review section by mistake, sorry. Great theme thanks. One small but annoying issue for me / resistance on main/profile screens. On my coils with 0.12 and 0.25 Ohms, the display is fine. But on any higher resistances - tried 0.25, 0.4 and 0.5 Ohms - the display only shows to the nearest tenth and not hundredth. I've tried changing how many decimals to be shown in source/options, nothing changes. Also removed the toggle colours on the main screen and magnified the resistance field, still nothing. Tried re-reading resistance - which always shows to the 1/1000 Ohm - but it won't show on the main screen. Tried a few other themes, no problems. Am I missing something? Thanks in advance for any help. Great theme / love being able to toggle colours. One small but annoying issue for me / resistance on main/profile screens. 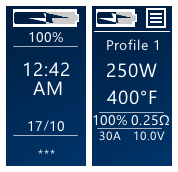 On my coils with 0.12 and 0.25 Ohms, the display is fine. But on any higher resistances - tried 0.25, 0.4 and 0.5 Ohms - the display only shows to the nearest tenth and not hundredth. I've tried changing how many decimals to be shown in source/options, nothing changes. Also removed the toggle colours on the main screen and magnified the resistance field, still nothing. Tried re-reading resistance - which always shows to the 1/1000 Ohm - but it won't show on the main screen. Tried a few other themes, no problems. Am I missing something? Thanks in advance for any help. Quiet here My first post. Just had to say that I love this theme - many thanks.